Friendship day was celebrated yesterday all over and we made it a point to wish all our dear friends to let them know that they are special to us. A few years while I was still in college I had a mentor from ICPF (Inter College Prayer Fellowship), he used to visit us in our college once a day every week. We used to look forward to that day very eagerly as he used to speak from the Bible and share real-life experiences. We didn’t have a common place for the meeting so we used to meet under the trees and sometimes we used to have a prayer walk around the campus. It was friendship week and I still remember that meeting which we had. He asked me – Who are your best friends? Do they know about Jesus? I listened very intently to him as he shared the word of God, we even sang this song “What a Friend we have in Jesus”. He reminded me once again that no matter how old we are – we have a God who would always be with us and will remain our Best Friend for life. How many of us have that kind of relationship with God? 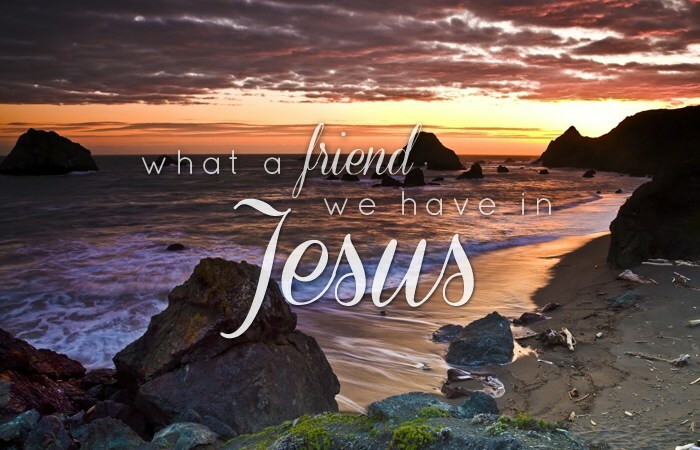 How many of us can say that yes “Jesus is my Best Friend”? “The information contained in this review is printed with permission from the author and publisher: Ace Collins, Stories Behind the Hymns That Inspire America, (Zondervan, Grand Rapids, Michigan, 2003). The great American evangelist Dwight L. Moody incorporated this song in his sermons, writings, and teachings. This caused many people to believe that the song is an American hymn. Not so. It was written by an Irishman in Canada. That young woodcutter was named Joseph Scriven. Son of a captain in the British Royal Marines, Joseph was born in Ireland in 1819. After receiving his university degree from Trinity College in London, he quickly established himself as a teacher, fell in love, and made plans to settle in his hometown. Then tragedy struck. The day before his scheduled wedding, his fiancé drowned. Overcome with grief, Scriven left Ireland to start a new life in Canada. He established a home in Rice Lake, where he met and fell in love with Eliza Rice. Just weeks before she was to become Joseph Scriven’s bride, she suddenly grew sick. In a matter of weeks, Eliza died. A shattered Scriven turned to the only thing that had anchored him during his life — his faith. Through prayer and Bible study he found not just solace, but a mission. The twenty-five-year-old Scriven took a vow of poverty, sold all of his earthly possessions, and vowed to give his life to the physically handicapped and financially destitute. Later, Scriven said, “The Lord and I together wrote the song.” Several of his friends got a copy and one of them carried a copy to a music publisher. Within two years the little poem of inspiration had been published and coupled to a tune written by an American lawyer, Charles Converse. Two decades later the great American evangelist Dwight L. Moody came across the song and believed it to be the most touching modern hymn that he had ever heard. It was Moody who gave the song a national platform and caused so many to think that the song had been written in America. Songs written from a personal relationship with Christ touches the lives of many. When loneliness, pain, betrayal hits you, this is one song that you can hear to bring soothing to your soul. The story behind the song “What a friend we have in Jesus” was referred from this source.